Gerhardt Knodel has contributed to the evolution and identity of contemporary work in the fiber medium for more than four decades. Early experiences in theater design inspired approaches for exploring new applications of textiles to interior architecture. His innovations were presented world wide in exhibitions and were commissioned for contemporary architecture throughout the USA. 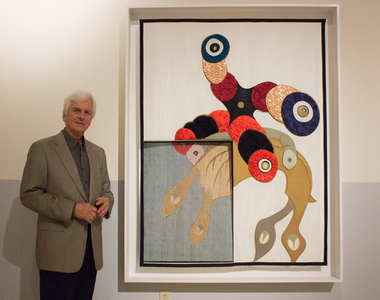 For 25 years he led the graduate program in Fiber at Cranbrook Academy of Art, and subsequently was appointed Director, being awarded Director Emeritus in 2006. He now maintains a full-time studio practice in Pontiac, MI. A distinguished career of exhibitions, commissions, lectures and publications has generated signification recognition, including the National Endowment for the Arts, The Japan-American Friendship Fellowship, the Gold Medal Award from the American Crafts Council in 2017. His recent work was subject for a major publication "What If Textiles: The Art of Gerhardt Knodel" (Schiffer, 2015).